All communication systems have modern hubs where data is processed and distributed. All these types of systems have server rooms that can range in size from small rooms to large fully climatically controlled rooms. Whatever the size of installation though, one on the most important criteria is the quality and reliability of the air conditioning system used to keep temperature control. Server room cooling is critical to many companies with internet and communication systems that are controlled by server based systems. All these systems require some type of air conditioning cooling system in order to operate in there optimum temperature range. When temperatures of over 35 degrees are experienced many systems will either shut down, or cause unexpected rebooting of computer systems. There are many types of systems available to cool server room installations and our sister company Saturn Sales Limited can advise on the most appropriate type of air conditioning products for you application. 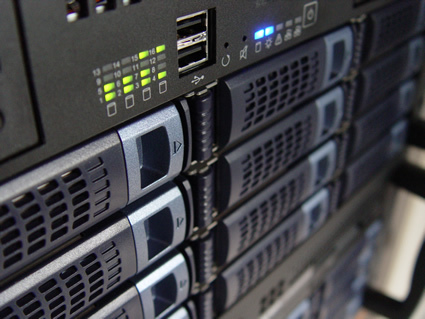 There are numerous points to consider depending on the size of the server room to cool. Often these rooms are very small, so the physical size of the air conditioner to be fitted is important and how for example how to be able to route the services to the indoor air cooling unit, need to be carefully considered. Another prime consideration is how important your server communication system is to you and the consequences for instance if the air conditioner unit should fail, due to overheating. If you cannot function should overheating occur we strongly suggest that you consider the installation of a back up air conditioning unit to cover any failure of the main system. The initial outlay may seem expensive but consider this against the cost of your company not being able to operate due to the failure of your communications system, can result in costly repairs. How do I work out what size air conditioner I need to keep our server systems cool? Well all electrical items emit heat when they are running, servers are just the same. If you look at the rating plate on the back of the server it will give you its maximum electrical load for instance 1.5kw so of you had two servers it would be 3Kw. You would then match the output size of a suitable size air conditioner unit to dissipate the heat, in this case a 3.5kw system. Keep in mind however if you intend to increase the number of servers in the future you need a large enough air conditioner to cope. Our server room is very small how can a I cool the room? One option if you have partition walls in the server room is to fit a portable air conditioner unit to the outside of the room and then duct the cool airflow into the room via a piece of flexible ducting. This would be attached to a wall plate on the wall of the server room, blowing in the cool air. How do you heat a large warehouse that is poorly insulated with large heat losses? One of the best ways to heat this type of area is to use an industrial gas heater as these offer high heat outputs, have a look at Saturn Sales website they have a large range of these types of products. However remember they do require a reasonable amount of ventilation which warehouses often have. Workshops for small businesses are another hard to heat space with often poorly insulated buildings. Small workshops less than 40 square metres are best heated using electric workshop heaters. There are large range of manufactures of these types of heaters from the likes Clarke and Broughton. Saturn Sales are a company based in England that sell a wide range of these particular manufacturers heaters which are available for quick delivery. How do you heat a large industrial area without it costing you a fortune? Most industrial areas do require heating to a temperature such as 20 °c but rather they require background heating of around say 16 °c. Electric fan heaters are often a good option and one model worth considering is the FF29 fan heater. This heater has a 29Kw heating output and can be fitted with ducting to distribute warm air throughout the area to be heated. Saturn Sales is a company we would recommend where you can purchase this heater from. Commonly used for industrial heating is the tried and tested propane space heater. These heaters come in a variety of heat outputs and are able to heat the smallest workshop to premises up to 500 square foot. They have the advantage of variable heat settings and have safety features such as automatic shut off should the heater become faulty. If you are looking for a robust and reliable heater we would recommend the propane space heater for a variety of applications. If you require a long lasting heater for your business premises take a look at the FF12 electric heater that is compact in size yet offers a reliable and effective heat output. Of steal construction with a powerful internal fan this heater is ideal for business building heating. There are many industrial heaters available on the market we would always recommend to check the warranty terms on the heater you are planning to purchase. As an example most manufacturers offer either a 1 or 2 warranty on the commercial fan heaters that they sell.